← Has Liberty Been Bred Out Of Us? In 1986 the British heavy metal group Judas Priest released their 10th studio album entitled, Turbo. In support of that album the band went on tour and subsequently released a live version taken from recordings over the course of that tour. On the live album Priest performs one of the songs off Turbo called Private Property in which singer Rob Halford introduces the song by saying, “Hands off, this is private property!” Now that I’ve given you a bit of rock trivia I’d like to continue by saying that is exactly how I feel about my rights…Keep your bloody hands off them! I have tried, literally dozens of times, to explain the principle that my rights are mine and neither you nor those you elect have the authority to deprive me of them. When those we call our Founding Fathers decided to sever the ties that bound them politically to Great Britain they signed a document which laid down the foundation upon which any system of government in America should be built upon. You see, people today don’t give much thought to the word unalienable. Unalienable means that something is unable to be transferred or taken away. Can I steal your DNA from you? Of course not, because your DNA is both inviolate, (meaning a part of your being) and unalienable. The same principle applies to your rights; nobody can take them from you other than the source from which they originate; your Creator. During the process of ratification of the Constitution many of the States refused to ratify it unless a Bill of Rights were to be added to it; ensuring that government could not infringe upon certain unalienable rights. 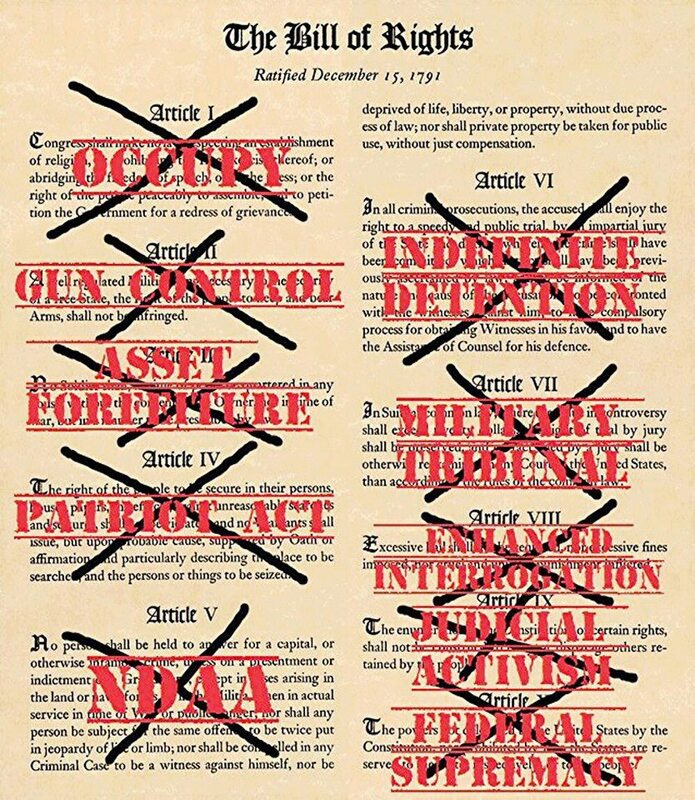 The first ten amendments to the Constitution list the rights that were agreed to by the States and which became things the government could not enact any law restricting. Typically when one says government they are understood to mean either Congress or the President, but that is not 100% accurate. The Supreme Court is also part of the government, and their interpretation of the Constitution has led to many a law being upheld which restricts our fundamental rights. Take for instance their ruling that prayer in school, (even when performed voluntarily by the students) violates the separation of church and state, and should therefore be banned. If you were to tell me that I cannot pray, whenever and wherever I want, then aren’t you depriving me of the FREEDOM to worship as my conscience dictates? It should not matter that you do not believe as I do; as long as I do not disrupt your life, or deprive you of your rights, then I should be free to pray whenever and wherever I choose. In his Notes on the State of Virginia, Thomas Jefferson wrote, “The legitimate powers of government extend to such acts as are only injurious to others. But it does me no injury for my neighbor to say there are twenty gods, or no God. It neither picks my pocket nor breaks my leg.” Here you see that the legitimate powers of government are confined to acts that cause injury to another. How does a person praying injure those who do not believe in the existence of God, or belong to a different faith? What is prayer if it is not those who believe in God communicating their innermost thoughts and desires with their Creator? To ban this form of communication simply because others believe differently than you is the ultimate deprivation of a person’s freedom of speech. How could the court rule one way in 1844 then turn around and change its mind in the 20th Century? Was it because the attitudes and beliefs of the people in this country had altered, and that the court was just keeping pace with how the people of America felt? Well, I wonder how many people know that in an interview for the Christian Science Monitor, Chief Justice Warren Burger said, “Judges … rule on the basis of law, not public opinion, and they should be totally indifferent to pressures of the times.” If a fundamental right was inviolate and unalienable back in 1791 when the Bill of Rights was ratified, it is just as inviolate and unalienable in 2018! How many laws have passed, and been upheld by the SCOTUS, which restrict our right to keep and bear arms? All I have to do is say, “Assault weapon ban” to prove my point. Where exactly in the 2nd Amendment is the qualifying terminology that restricts our right to keep and bear any category of arms? People support these laws because they want to feel safe when they leave their homes and they believe that an assault weapon is not required for the hunting of deer. This shows me that they do not understand WHY the right to keep and bear arms was so vitally important that it be protected by a constitutional amendment. We do not have the right to keep and bear arms so that we can hunt deer, nor shoot those who might burglarize our homes; we have the 2nd Amendment so that the people of this country might be sufficiently armed, and trained in the use of those arms, to comprise a force that could rise up against the tyranny of their government. Yes, I’m talking about revolting against your government; for isn’t that EXACTLY what our Founders did when they stood at Lexington and Concord when the British attempted to deprive them of the same right our Founders later protected by ratifying the 2nd Amendment? To pass a law which deprives us of this right is to say that we must submit to the arbitrary will of a government that is better armed than are the people who created it; and this is true whether those laws are passed to provide you with a false sense of safety and security. People say they want to be safe from the actions of criminals, but do they ever stop to ask how they would be safe from the actions of a criminal organization known as government? Yet today we have laws restricting what type of guns we might own; the capacity of the magazines those guns can hold; the addition of things such suppressors…all of which are limitations upon our right to keep and bear arms of all kinds. All of these laws have been passed because there is an ever growing climate of fear regarding the private ownership of firearms. Guns are what gave our Founders the ability to resist the tyranny of King George III. Can you imagine how the American Revolution would have turned out had the Redcoats gone into battle with muskets while the Colonists were limited to bows and arrows? Can you imagine the outcome of the Battle of Gettysburg had Lee’s Army been equipped with modern day weaponry; the South would have won its independence from the tyranny of Abraham Lincoln and his overbearing government. Now I want you to read something. Although this is not a law, nor a Supreme Court ruling, it still bears a great deal of consideration when you are deciding whether or not to support a measure that violates any of our fundamental rights; be it the right to pray freely or the right to keep and bear arms. This comes from the 16th American Jurisprudence and I suggest you think hard about what it says, “The general rule is that an unconstitutional statute though having the form and name of law, is in reality no law, but is wholly void, and ineffective for any purpose; since it’s unconstitutionality dates from the time of its enactment, and not merely from the date of the decision so branding it. An unconstitutional law, in legal contemplation, is as inoperative as if it had never been passed. Such a statute leaves the question that it purports to settle just as it would be had the statute not been enacted. Now I’d like to focus on 7 words from that statement; .”…bestows no power or authority on anyone…” How is it that the government can create agencies whose sole function is the enforcing of laws that violate a fundamental right, or how is it that local law enforcement can arrest and imprison people for exercising a right that the government has no authority to restrict? Who, in reality, is the criminal in these instances; the person who is exercising their right, or the government or agency which passes laws and punishes them for doing so? Remember, for a crime to be committed a person must violate the rights of another, so whose rights are being violated by those who attempt to own firearms the government has deemed to be illegal? Just doing their job, just following orders does not justify the punishment of those exercising their fundamental rights; and makes tyrants of those who commit such crimes against our rights; no matter how much good they do in the other aspects of their chosen profession. The Nuremburg Trials upheld that principle; that just following orders did not relieve a person from guilt when they violate the rights of others. Our government is guilty of violating almost every single right we have; including our right to property. If we do not pay the property taxes upon our land we can be evicted from it; even if we have paid it off in full. If we do not pay registration fees on our vehicles we can be fined or imprisoned for operating them on public roads. We need to purchase a license or a permit to hunt, to fish, and even to build a home. Our income, the very fruits of our labors, is taken from us in the form of taxes and spent upon things that are blatantly unconstitutional. How anyone can consider themselves free is beyond me; unless of course freedom to you is defined as what clothes you choose to wear, what food you will eat, and what mindless drivel keeps you entertained. And even those things are taxed; so they are not free either. If you, because you fear, or are offended by what others do, seek to restrict the liberty of the one, or the many, then you are just as tyrannical as any form of government. If you do these things because of your misguided understanding of what rights are and why we have them, then you don’t know the first thing about why our system of government was created, and should be restricted from participating in choosing those who represent us in that government.